If you are even considering buying a pair of the best adjustable dumbbells, that tells me you are working out at home to save money on a monthly gym membership or you have a home gym you want to expand. My hope is to help you find a set you can use for your own personal use at the best price. Don't do what I did and buy each individual dumbbell and spend a ton of money. There are plenty of options now to do your workout and not take up a whole side of a workout room with dumbbells. 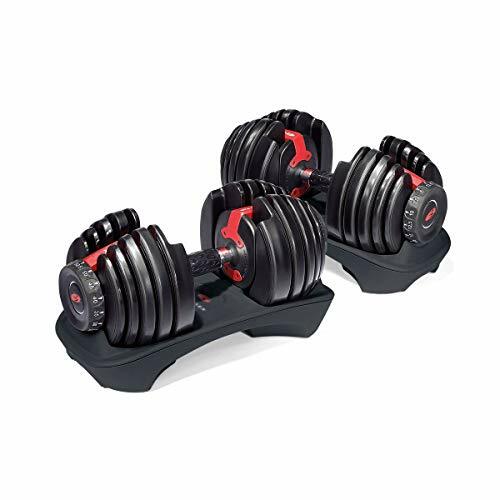 Bowflex being one of the top fitness equipment manufactures in the world bring you a sweet set of adjustable dumbbells that go up to 52lbs in weight. They are easily adjusted to different weight settings by using a dial. They come with a storage case and are great save spaces for people with a small workout space. Replaces 15 pairs of dumbbells! Why Should I Buy Adjustable Dumbbells ? - Save Space! Most of us are lucking to have a small dedicated room for working out. For the rest of us I bet the kids have not taken over or it's dedicated to a spare bedroom. So you are forced to workout in your living room! With this small dedicated room I have or for others, it could be your living room or garage, I have to be very conscious about what I put in there. It's such a small space that if I put too much crap in there I can't even do my workout. Adjustable dumbbells have to be the biggest bang for your buck in any piece of home gym equipment you buy because of the 100's of exercises you can do with them and the small amount of space it takes up. You combine these with an an adjustable weight bench and you dang near have everything you need to get after it. I'm going to list out the most popular models so you get straight to the point of looking at what you need to buy that is not a piece of crap. 🙂 I have the top models separated into each different type to further help you narrow your choices down as they are different. This model has been extremely popular for years. I have used these personally and they absolutely work for any exercise you can think of. They do use a dial system to select the amount of weight in 2.5 pound increments. The plates are covered in plastic, so you definitely can not drop these at all. We have dropped them on accident and they didn't break but, if it's done enough times, you won't be happy with the results. You can purchase a stand for these which is optional and it's a best seller on amazon so there are many satisfied customers out there who love this set. If you want more information read my review here. This set is designed to move the pin to the desired amount of weight you want to lift with. Xmark has 2 models for you to choice from which is a 25 lb or 50 lb set. They increment every 5 lbs, handle is 12 inches long and comes with stand to store them on. These are built to last as they are chrome and really look nice in your home gym. They do sit in a plastic case for storage so you can sit them on the floor tucked away. One thing to note about these is that customers have stated that it is difficult to get them out of the case then adjusting the weights. This set has chrome steel plates. You can slide the pin selected from 10 to 50 pounds of weight. Many customers complimented how easy it is to slide over and use which a more positive than the xmarks. These do sit in a plastic tray as well. You might want to sit them on a table or even crates to get them off the floor so you are not bending over to get the weight. 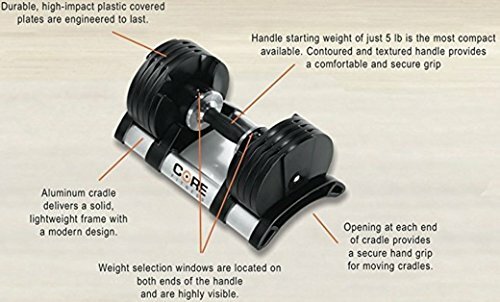 The core fitness dumbbells allow you to switch from 5 to 50lbs of weight by turning the dial on the inside of the handle. 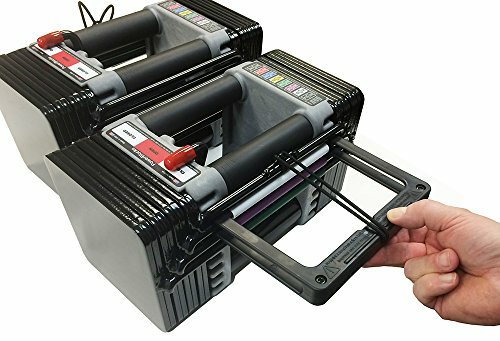 This is direct competitor to the bowflex 552 set we talked about. The weights are covered with a high impact plastic for durability, but I would not recommend dropping them like you do with cast iron weights. It comes with a nice modern storage case that is light weight and made out of aluminum. The handles are textured for an easy grip and are slightly contoured to hold them secure. In order to change the weights, you simply twist the dial in 5lb increments to the weight you want and lift up to start your exercise. Only goes to 50 lbs. Probably not an issue for most. Only 5lb Increments. I would prefer 2.5 to offer more weight options. These are very popular and come in different ranges of 45 to 75 pound kits. What makes them stand out is that you can buy expansion kits for them and go really heavy with them if you need too. Their is also a stand for them but you need to buy it separately. That stand is nice because you can store the extra weights in there rather than laying them on the floor when you are not using them. The plates are square welded steel with a chrome handle. To use the Ironmaster quick-locks, you utilize the special lock system that pulls out, allowing you to remove or add more plates. It's really simple to use and comes with a nice stand to store the weights set. You can literally buy the 50 pound elite set and expand it to 70, 90 or 130 pounds! No excuses with these guys you can jack up the weight here. You literally replace 16 pair of dumbbells with these bad boys. This is where I personally lean towards because I like to go heavy for my bench press workouts. I also plan on dropping them without worrying about breaking them. I only do this of course when I'm pushing 100 pound pairs and I don't want to carrying them both or come up with them from a lying position. These guys are also the quality of dumbbells you will see in the gym. The handles are plated in chrome and the weighted plates are cast iron with a semi-gloss coating that is rust proof. What's cool about this is that if you compare a 52lb set price against the bowflex seletecTech 552, they are actually cheaper than the 552. Both of these guys are solid and I would recommend buying. 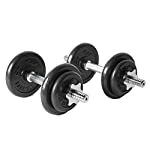 You can buy these cheap dumbbell sets starting at a 40 pound pair and go all the way up to a 200 pound dumbbell set which is actually 100lbs per dumbbell. You can buy extra weights to expand on them as well. Lastly, they secure tightly with a start collar lock so the weight plates are solid and don't bang around when you are lifting them. You can read more on what I found here. These are really sweet. You have a lot of options with them and man they are heavy duty. You can get these in cast iron or plated with chrome. I am just personally a fan of collar locks. They just feel more real to me and are easier to do exercises like tricep curls and bicep curls. I also love the fact that the handles are threaded. So, when you put the collar lock on you literally turn it tight which in turn prevents the plates from rattling around when you are doing something like an incline press with them. Cap barbell is one of the best fitness makers in the industry and it's not surprise that their dumbbell set is a really popular set that people are buying to workout at home. 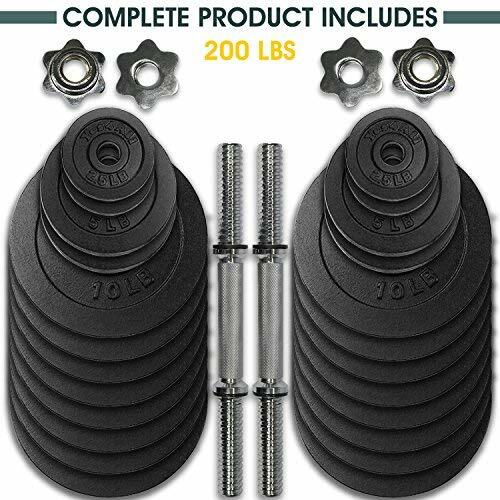 This is a standard 40 pound set that is perfect to get started, cheaply priced but made with quality products you would expect from Cap Barbell. They do have larger adjustable weights if 40 is not enough. The handles are steel with a knurl pattern that makes it easy to grip. The collars are threaded so they lock in the weights very secure and won't move around on you like other dumbbells do. This is a big bonus! This is a great beginner set, especially for women you don't need a lot of weight for your workouts to get started. Now, I do want to mention that you can buy extra plates for this that will allow you to increase the total weight that you can use with it. So, it is expandable and overall a really nice set for the price point. Ok, honestly at this point you seriously have a great list of the top rated dumbbells you can buy. This little bit here will help you justify the cost you will have purchasing a new pair of adjustable dumbbells. Let's assume that the going rate for a solid dumbbell is $1.25 cents per pound. So, let's also assume out of an adjustable dumbbell set we can get 11 pairs of dumbbell combinations to workout with. With most sets there is actually way more than 11. The complete weight for all 22 has a full weight of 670 pounds. We multiply 670 lbs by $1.25 which equals $837.50. Let that sink in for a minute. 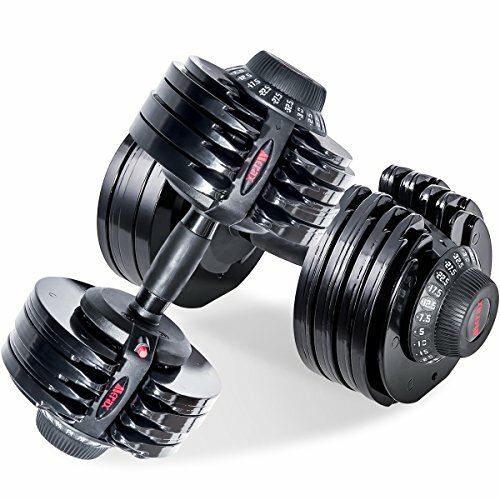 🙂 The adjustable dumbbell sets we will look at will be in the 200-300 dollar range, so you will be saving $500-$600 dollars by not buying them individually. On top of that you would have to buy a rack to hold them, so add another $100 dollars in savings on top of that. Ok, all of that so you could feel a lot better about purchasing the best adjustable dumbbell set for your home gym. It's the right decision, so no more worrying about that. Who Are the Manufactures of Adjustable Dumbbells? Bowflex is one of the most popular brands you will find as an option when you are searching on the web and rightfully so. The have been making home gym equipment for years and have a great reputation. You will also see a company called powerblock. They have been around a long time as well and I'm betting you might have seen these in your local gym. 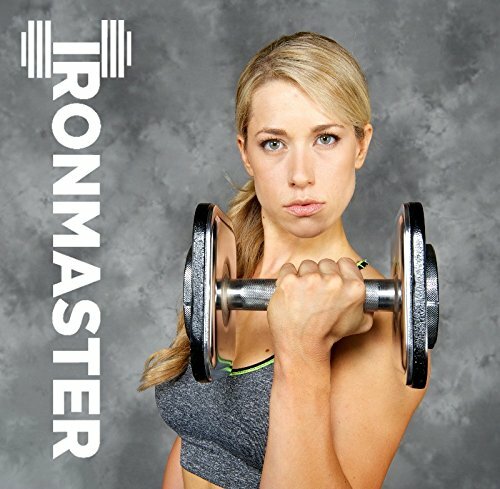 Next up are three others that I'll mention as well because they are among the leaders which is Ironmaster, Golds Gym and Universal Home Fitness. There are of course others, but these guys are the main players that have lasted through the years. I will say that I can't say there is one that is better than the other. It will come down personal preference. I'll give you a brief description of each type and how they work so you can see the differences and figure out what you would prefer. First up is a dial used to select the weight increment on the dumbbell. You literally turn a dial to say 15lbs on each dumbbell and then lift up on the dumbbell bar which in turn brings 15 pounds with it and leaves the rest of the weight behind. I can't say there is any real disadvantage in this. My personal preference is that I don't like the fact that the dumbbell is half packed together. (personal preference). They are sensitive to dropping though. You cannot just drop these things. If you do, you risk breaking the dial system. Second up is a selector pin used to set the weight on the dumbbell. The best example of this is power block which is a square dumbbell. You literally move the selector pin to the weight you're wanting and it instantly locks in that weight on the dumbbell. So, that the weight comes off when lifting the dumbbell, which is very similar to a system that uses a dial. Last up is a standard collar clamp or clamp that spins tight on the dumbbell bar next to the weights. This is more traditional and locks the weights in place. It's a normal dumbbell, with normal plates secured to the bar to lift with. This is my personal preference and is what the Pro Iron offers. It also allows me to throw them around and drop them when I'm using heavy weight. I'm going to give you the 5 main things you need to consider to pick out the perfect dumbbell set for your gym at home. I promise we will make this short and sweet and you will have enough information to make the right selection for your budget. So, let's get started and dig into why you really should be looking into buying a set for yourself. Let's find a set you will love and get rocking below! Step 1: What I would like you to do next is to figure out what is the most weight you will need for a single exercise. Most likely this will be dumbbell bench press, squats or lunges because of the large muscles being used. For me, I will get into the 70-90 pound dumbbell range on my press (on the bench). Big deal right. Well, it is when you are selecting which set to buy. Most of these go up to 50-55 lbs and that is it. In my case that limits my options to pick from. On the other hand if you need less than 55 pounds you are golden. You have a lot of options. Write that done on scratch piece of paper on what you need. Step 2: Ok, is storage going to be an issue? I'm asking this because some of the sets have a stand that they come with or case, where others don't. The dimensions of the weights might matter as well. Not a huge deal here but something to think about. Step 3: In the exercises you will be doing at home, what type of weight increments do you need. It ranges from 1.5, 2.5 and 5 lbs. This could make a difference in the lower range of weights when you want to be able to have weight ranges in between 5-15 lbs. Some of the shoulder exercises I do require light weight. I'll find myself needing an 8 lb weight instead of a 10 lb weight for example. 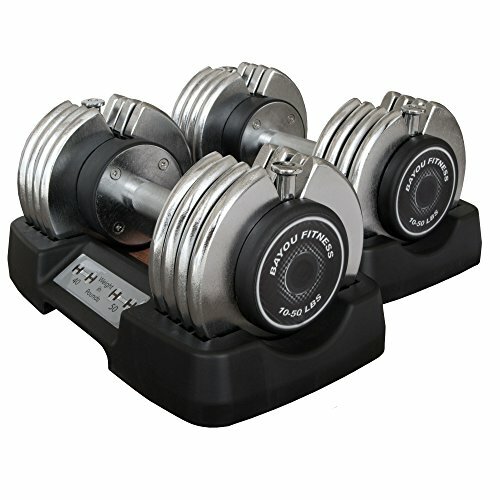 I would love to hear your feed back or questions regarding which best adjustable dumbbell to buy for your home gym. Feel free to comment below or contact me. p.s. Again my recommendation is the Yes4All Set Here. FYI: I updated the list for 2018 and 2019 with new dumbbell sets. One of my favorites now is the Merax Deluxe that compete with the Bowflex 552 but go up to 71 pounds. Amazong Information About Adjustable Dumbbells Guys. Impressed By your way of explaining.